Adaptive premium template for CS-Cart with 20+ extra features and 6 commercial addons on board. Use it, to make fast, modern and fully functional store, using CS-Cart as a platform. Enter desired number of theme using on your domains. For Ultimate installations all domains are needed to be licensed. Please enter a valid addres(es) of the shop where you are going to use the add-on. If you purchase the add-on for multiple stores, specify all the store addresses, separated by commas. Do not use localhost and non existing site names! Also we can install theme on working site with third party addons, but the cost of this operation will be individually in every case (after analysis). Contact us for this cases before your order. Special addons packages, that pump your store to the full power !!!! This package will increase the average size of your order! These addons will reduce the number of pending orders! It looks great on tablet screens in both horizontal and vertical position. Thorough minimalism and convenience viewing. Clients of your online store will have very comfortable shopping on mobile gadgets. All technical wishes of the variety of clients were considered, as well as carefully worked out a convenient and minimalistic design. Interesting and useful solutions will help customers to use your online store and make purchases with comfort. Quick view that would be desirable to use! 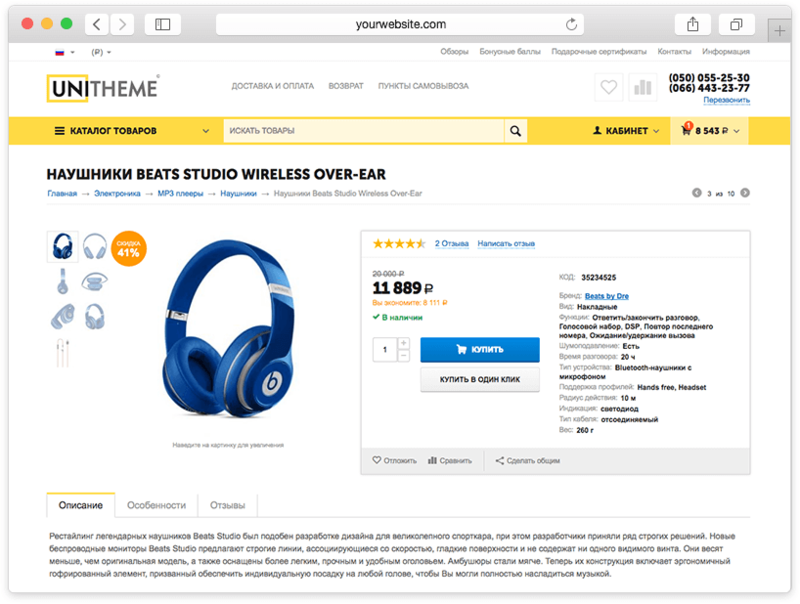 All page elements are conveniently arranged and thought out (by marketers in the field of e-commerce)! In the panel were included all main elements of user navigation. When scrolling content pane takes a fixed position at the top of the site, it allways allows the customer to see the menu, search, personal account links and shopping cart. User will choose comfortable for him category view, which will undoubtedly improve the behavioral factor and loyalty to the store.! Label color the depends on the discount size, hottest offers with big discounts will be purchased more frequently. Conversion metrics will be improved. You can edit colors for discounts labels via visual editor. 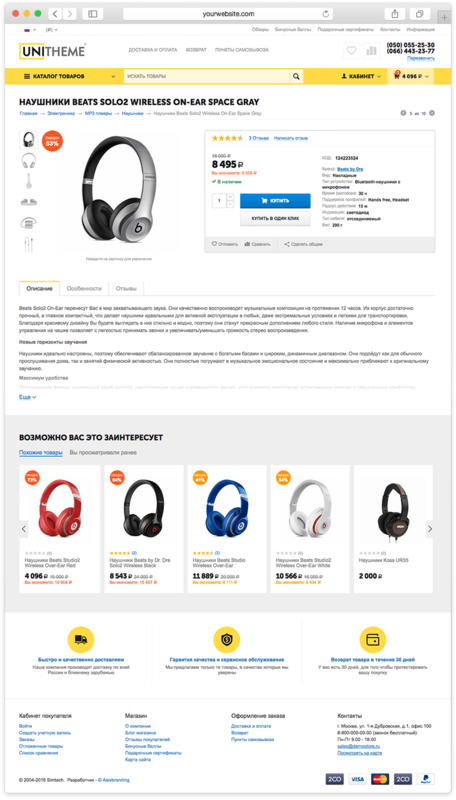 We have included in our template special usability"chip", which allows one-touch stretch the layout of the list of products in a full width of the page as well as hide the filter block section, which will allow the customer to focus on selected offers without much information. Create professional banners without design skills, just copy the picture and enter through our text editor. In 2 minutes you will get the most effective, responsive in all resolutions banner, which can also carry more and SEO features. 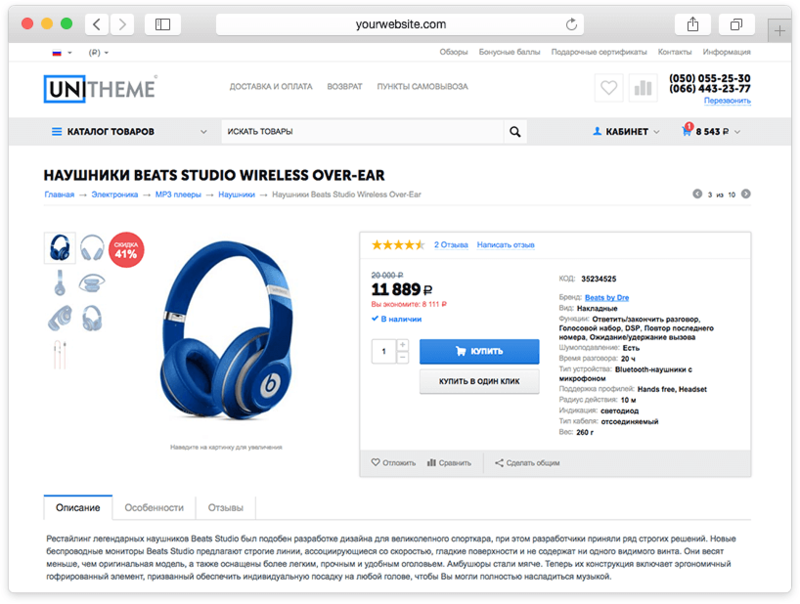 Place the banners directly in product grid on category pages, advertise, notify, stimulate original and effective, as leaders make. Use convenient and unobtrusive pagination of products, with will help customer to see more products and inform him how many items left in the list. Create promotional items, marked with a label in the special lists, as well as having a countdown timer to the end of the action on their detailed pages. Promote actively them on the main page with a special promotional block. Achieve maximum performance from all the coupon shares. Place the content in tabs to be convenient to the user to access multiple blocks from a single screen. Better usability pages. Special addon mode allows to load content tabs just by click on it and not when the page loads. Save resources, get more speed even for large content pages - get better SEO. 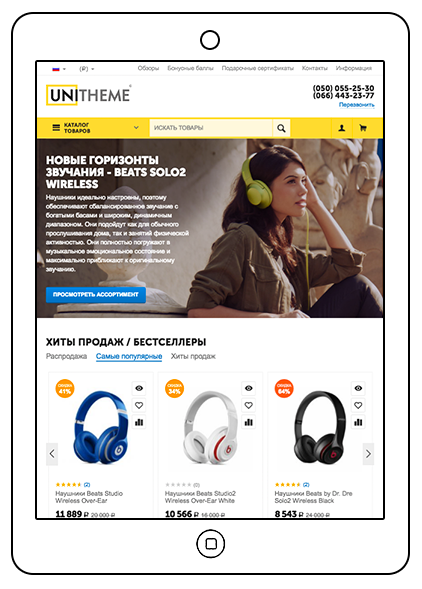 In the design of the home page of UniTheme we moved away from CS-Cart standard functionality and have implemented some extra features, not covered by the basic platform template for your online store . Now it has excellent vies and all the modern tools to work with the audience. Very serious approach to the design of the category page was used. The page has been SEO optimized (visual block with the filters on the left, but in the code it goes after the block of the main content), bread crumbs are also located below the H1 header. Description of categories, we also placed at the bottom of the page (and the search engines and customers are happy to not interfere). Addon - banners in the commodity grid will help to create additional relinking and promotes a greater depth browsing. We worked out two product templates. The location of all elements on the page provides good conversion. If you have any suggestions for modification or amendment of certain elements you can always order the individual revision to suit your needs. Extra style for the tabs and functionality "more product description"
The basic version of the template has six carefully selected color schemes. Everyone will be able to choose for themselves the finished color scheme or order the integration of colors to suit your corporate identity. As well as using the editor, you can try yourself as a designer and choose the color to your liking. в ближайшее время мы адаптируем шаблон для работы с мультивендор системами CS-Cart. Касательно схожести с Техносилой хотим добавить, что при создании шаблона был учтен положительный опыт крупных игроков рынка электронной коммерции в вопросах удачного расположение элементов, функциональности и адаптивности, так что в элементах четко читаются и элементы других лидеров. Концепция шаблона - осуществить мечту любого владельца интернет - магазина - иметь вид лидера, установив готовое решение. Thanks alexbranding for my store theme. UniTheme is like my dream, i have intsall it myself in 1 hr and have the best ever store. I have several suggestions to developers and i have recieved an answer: next releases it will be fixed and integrated without any payment. 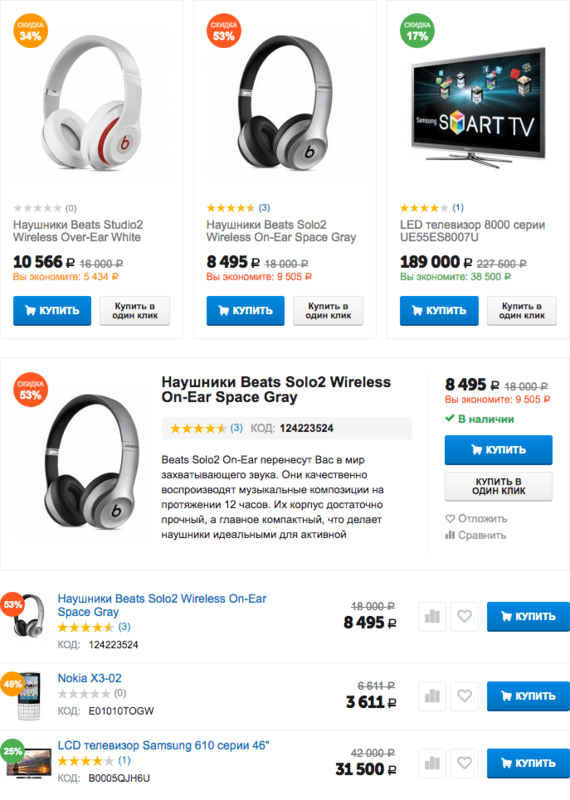 Отличное тема для Сs-cart, все очень хорошо выглядит, дорабатывать практически ничего не нужно. Идеальный вариант для быстрого старта качественного интернет-магазина. Всё скрупулезно и со вкусом сделано и расположено в нужных местах. Отдельное спасибо тех поддержке которая помогла мне с некоторыми вопросами при установке темы. Ставил тему на 4.3.9 около месяца назад сайт немного поднялся в позициях и стал работать ощутимо быстрее. Показатели глубины просмотра страниц немного стали меньше но средний чек стал больше и в целом количество продаж поднялось. Тема выглядит супер и по управлению добавленными элементами нет проблем, все отлично! В общем и целом тема для карта очень удачная. Позволяет не придумывать дизайн и не тратить кучу денег на внедрение. Есть несколько удобных "фишек" - ресайзер, цветовая температура стикеров, товар дня, достойно оформлен блог и его выводы, отличная мобильная версия и настройка дизайна. Настройка темы довольно простая и не дорогая, если заказывать интеграцию у разработчиков. Online store of coffee, tea, coffee machines and accessories to them from the most famous brands. The project was implemented on the basis of the premium theme UniTheme for CS-Cart. eCommerce reality show participant - organized by the commonwealth of the most popular in Russia ecommerce-services and companies. The project is created on the basis of the premium template UniTheme for CS-Cart. Online store, selling kitchen appliances and utensils from the most famous brands. The project was implemented on the basis of the premium theme UniTheme for CS-Cart. Online store of telecommunication and network equipment, firmly occupies its niche in this sphere. Turnkey implementation of the premium theme UniTheme for CS-Cart. Online store ToolsGrad.ru Power tools wholesale and retail: more than 10,000 models from leading manufacturers with delivery throughout Russia. 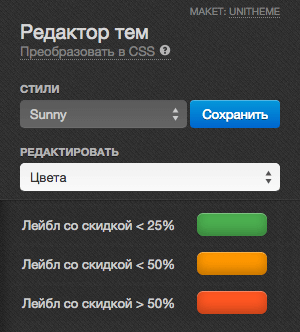 The project was implemented, using UniTheme for CS-Cart. Online store of European handmade jewelry with genuine Swarovski crystals. The project was implemented on the basis of the best UniTheme template for CS-Cart. HmizateMall - large (multivendor) online store for the sale of equipment in Morocco. 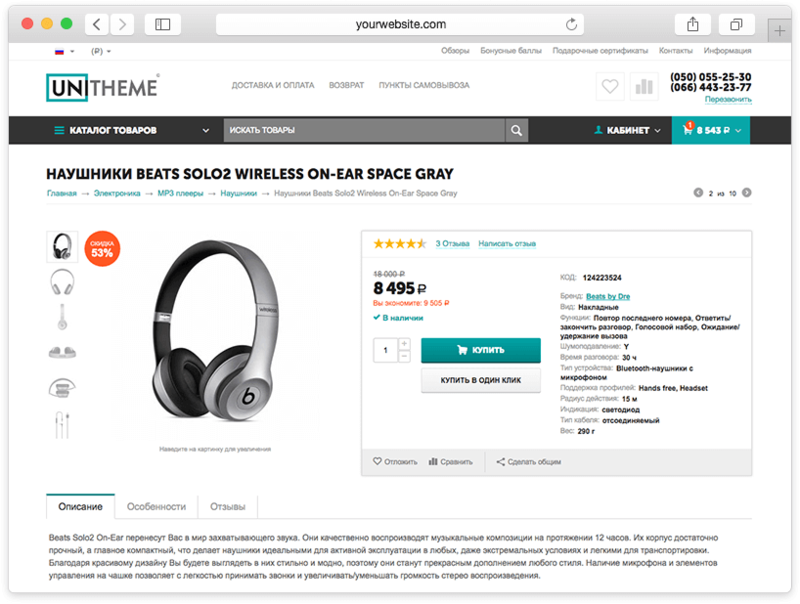 The project was implemented by the customer by himself on the basis of the premium UniTheme template for CS-Cart. One of the most popular online stores, selling auto accessories, auto parts and tuning elements in Romania. The project was implemented on the basis of the best premium template UniTheme for CS-Cart. Rental of equipment for events, celebrations, conferences, weddings. 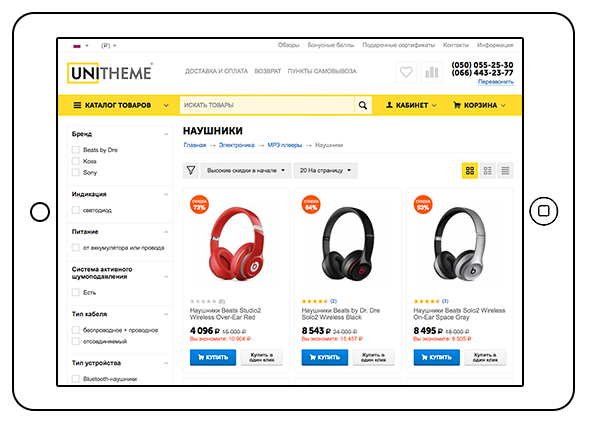 The project was implemented by the customer by himself on the basis of the premium UniTheme template for CS-Cart. Online store "Artior", high-quality furniture for home and office, from the manufacturer. The project was implemented on the basis of a premium UniTheme template for CS-Cart. Online store "Nardline" is selling its own products in the field of table games. 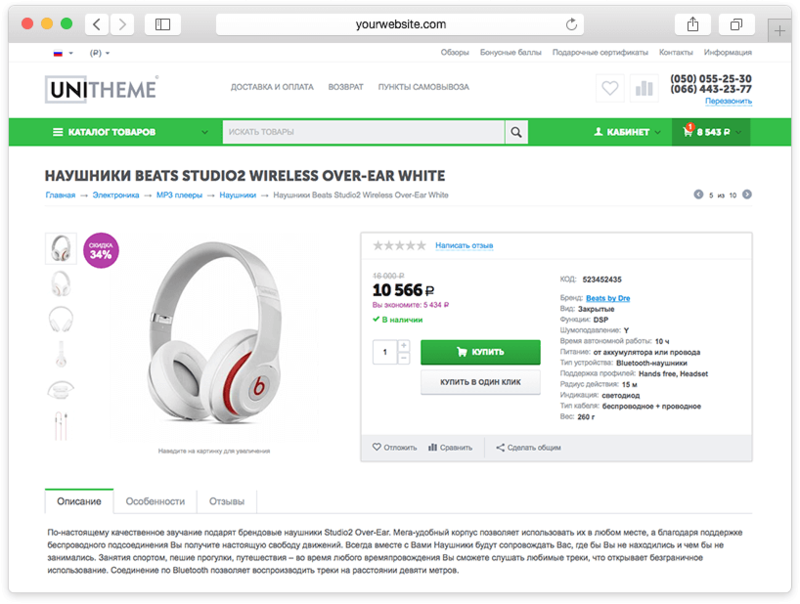 The project was implemented by the customer by himself on the basis of the premium UniTheme template for CS-Cart. Dolinski.pl is not just an online store, it's a large chain of stores, selling and servicing branded watches for over 42 years! The project is implemented on the basis of the premium template UniTheme for CS-Cart. ShopTool online shop was created with the purpose of providing our customers with high-quality and original products of leading tool manufacturers. The project was implemented on the basis of the premium theme UniTheme for CS-Cart. Professional store "Everything for the child", in which you can quickly and cheaply buy high-quality products for children. The project was created on the basis of the premium template UniTheme for CS-Cart. Online store - Farla, pillows for pregnant and lactating mothers, quality products for children. The project was implemented on the basis of the premium template UniTheme for CS-Cart. Want to buy a fresco on the wall, surprise your beloved or children with bright colors - choose ready-made frescos from the catalog, make wallpapers from personal photos. 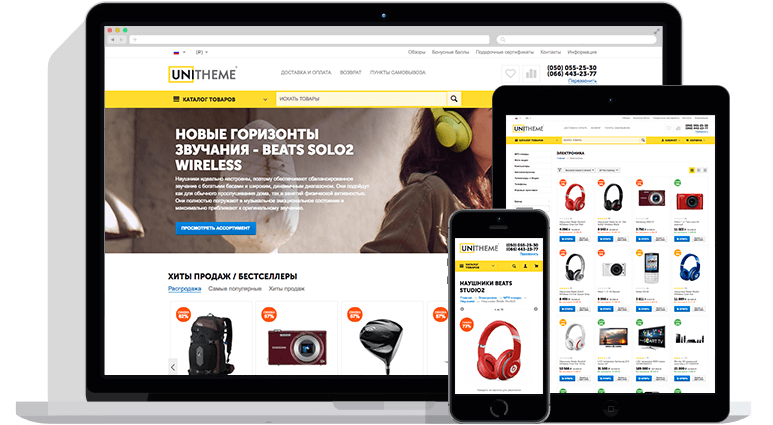 The project was implemented on the basis of the premium template UniTheme for CS-Cart. Online stationery store - Wide choice and affordable prices for stationery. The project was implemented on the basis of the premium theme UniTheme for CS-Cart. 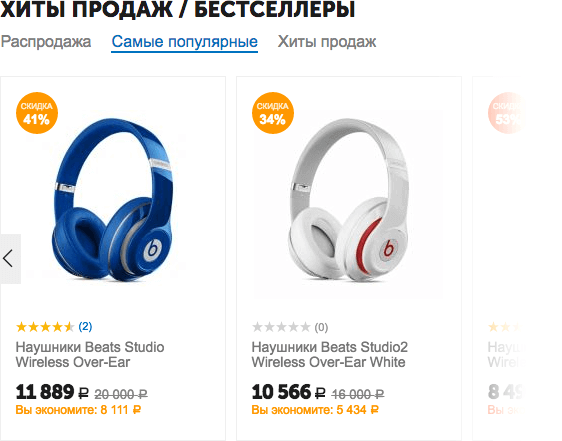 Online store Stalik Khankishiyev, where you can buy all the books of his authorship with delivery anywhere in Russia. The project was implemented on the basis of the premium theme UniTheme for CS-Cart. Online store Armygear - is a supplier of military and tactical equipment for soldiers and other professional users in Norway and abroad. The project was implemented on the basis of the premium template UniTheme. Online store of the company GenPribor - delivery of devices and equipment for industry. 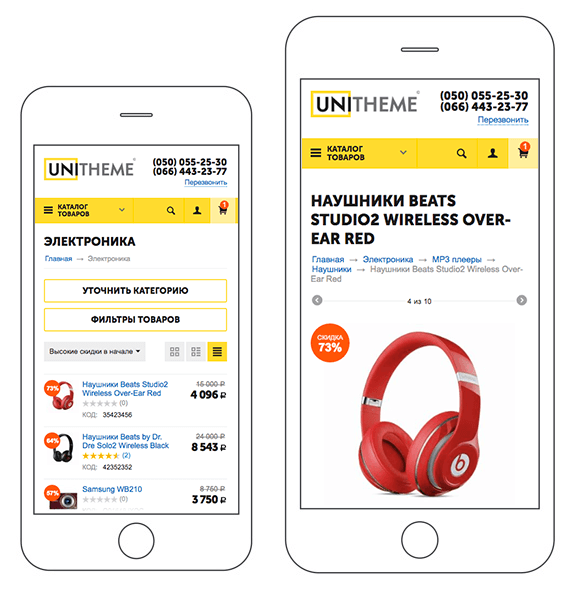 The project was implemented independently by the customer on the basis of the premium theme UniTheme for CS-Cart. Online store of professional cosmetics and original perfumery with delivery throughout Russia. The project was implemented on the basis of the premium theme UniTheme for CS-Cart. The online cosmetics store "Elitkosmetika" sells cosmetics in Moscow and the region. The project was implemented on the basis of the premium theme UniTheme for CS-Cart. Adds several sitemaps with one index file (images map, seo filters map, etc). Automatically adds unique tags alt and title to all the pictures with templates on store pages. Adds possibility to generate meta tags and title headers with advanced templates. What you get as a result - a complete set of tools to promote your store, which has no your competitors. Flawless appearance + adaptability + SEO = success of your project. It is a service of preparation of your project and the server for maximum speed page generation, high performance and security. The service is provided by professional sytem administrator with extensive experience in configuring and optimizing servers for CS-Cart projects. What you will get as a result - maximum performance, security, instant loading of the pages, the ability to further support the professional server administrator. AB dev team guarantees limited technical support to customers through its own technical support system. 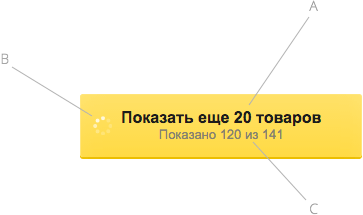 In order to use the technical support, authorize on the site and click the "Support" button. SubscribeSubscribe to our news and latest developments of modules! © 2016-2019 Alexbranding - solutions for CS-Cart.